A bonus ski day. 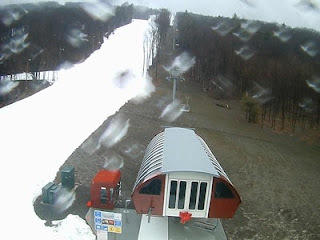 Bristol Mountain Resort has a plethora of snow. I estimate at least 24 inches covering all of the main slopes with snow making. Great corn snow conditions although the ungroomed slopes were hard and rough early in the day. However by noon all slopes had softened to spring corn snow conditions. I left Cortland about 7:45 AM and managed to be on the slopes by 10:00 AM. The high speed quad whisks you to the top quickly and I was able to make over five runs per hour. It can be a tiring cycle with the high speed lift, so frequent breaks are in order. I had forgotten how long the trails can be there. The warm up easy trail seems to go on forever and is a great way to start the day. There was a small crowd on the mountain so I was frequently riding the quad alone. There seemed to be a few geezers among the skiers in the morning, but within an hour or two most of them were gone for the day. I must have had over 15 runs for the day, broken up by brief coffee and lunch breaks. Although it was cloudy, the visibility was good. Arrived home about 3:50 PM with a bit of fatigue from both the skiing and driving. Many thanks to Pat R. for the voucher for a lift ticket. Can't beat the zero cost for my lift ticket. Food at Bristol is quite good and reasonably priced. The servers are happy to have someone to talk to since there are so few customers. All in all a bonus day of skiing for the season. Only wish the area was closer since they plan to be open until April 4. I'll try to stay awake tonight for the Cornell-Kentucky basketball game. Go Big Red!! Happy Birthday Pret -90 Years Young!